If you’ve been following me for a while, either on the blog or on Instagram, you know I love my layers. We’ve been having a snowless winter so far, which means that I’ve gotten to rotate my outerwear collection and not gravitate towards the coats I save for snowy weather only. However, I had to break out my J.Crew Chateau Parka this past week as it was the perfect compliment to my Friday layers. After swooning over this coat at the beginning of last winter and telling myself over and over again that I did not need a new coat, when it (finally) went on sale in April, I bought it and stuck it away until winter. Ok, I want some snow to wear this beautiful coat more! 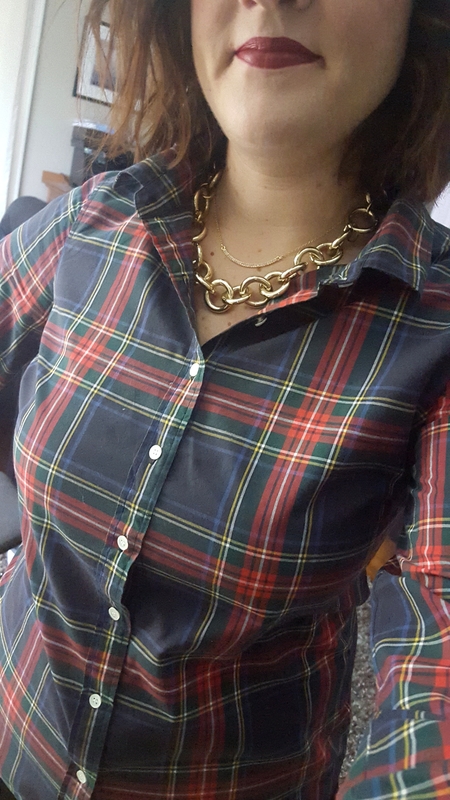 It’s also time for tartan! I usually wear this shirt layered under another top but after seeing it on an Insta friend paired with red shoes, I wanted to try the look for myself. 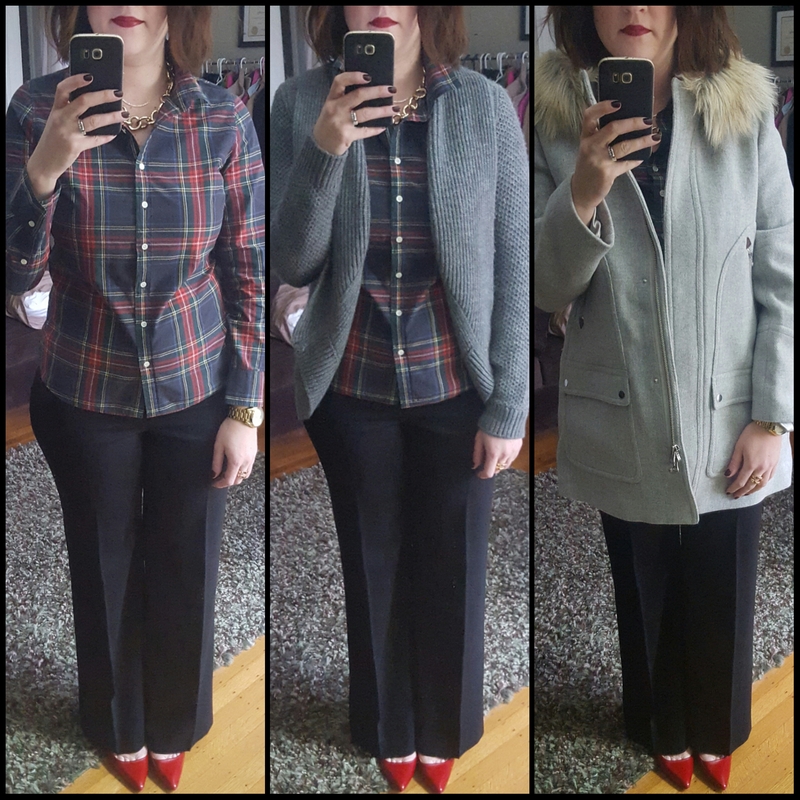 These J.Crew trousers are one of my current favorite pair of full length pants. I still love my ankle pants but it’s nice to be able to wear some full length pants! Here’s a closeup of the shirt and my lip color, NARS Audacious Lipstick in Audrey layered over the Velvet Matte Lip pencil. I am a huge fan of the Audacious lipsticks – they’re pricey but they last all day and even longer layered over the velvet matte lip pencil. My other favorite coat of the season is the J.Crew Stadium Cloth Cocoon Coat. I sized down one size in this coat and it is the coat I find myself reaching for morning after morning. This is another one that I held out to buy until the end of the season and I have been wearing it non-stop. I am also a huge fan of the Factory version of this coat, the J.Crew Factory City coat, which is lighter and shorter but was the perfect coat for fall in the Northeast. 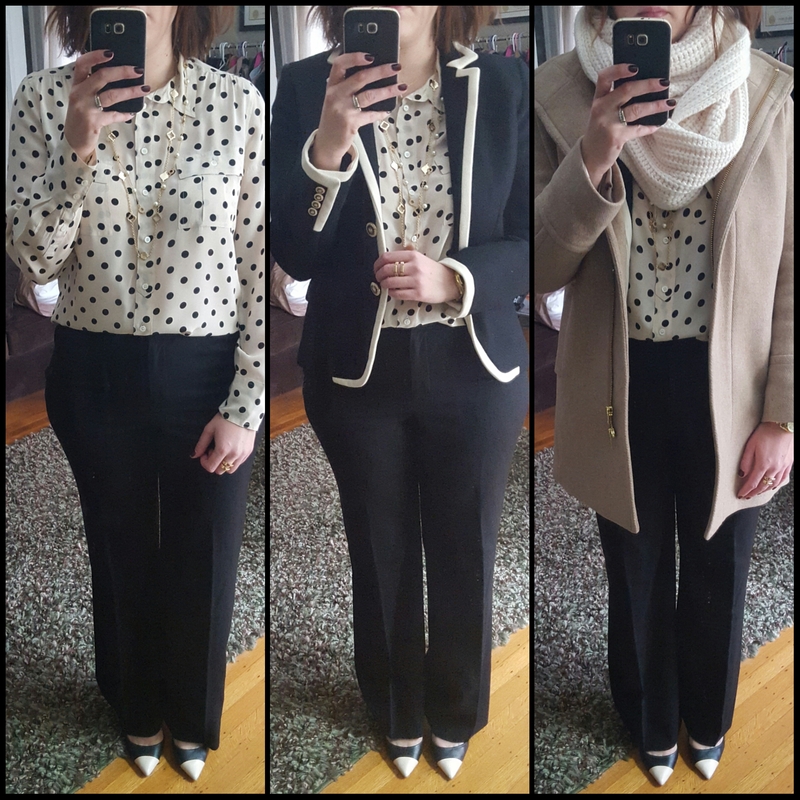 I am wearing a lot of older pieces today, the J.Crew Polka Dot Blythe Blouse, Tipped Lexington Blazer and Cap Toe Everly Pumps. So there you have it, some layered looks with my favorite outerwear. Would love to hear what you think and thanks for visiting!